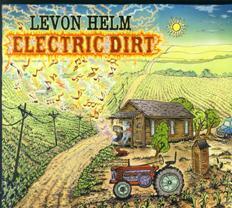 George Graham Reviews Levon Helm's "Electric Dirt"
There are certain performers whose careers have spanned generations and who have subtly become part of the stream of music, through either their distinctive sound or their ubiquitous nature. Levon Helm is one of those. The drummer and frequent lead vocalist with the seminal 1960s group The Band, Helm has just released a new solo album called Electric Dirt. Born in Arkansas to a farming family, Helm's father was a music lover and encouraged his children to play and sing. An early encounter with Bill Monroe and the Bluegrass Boys at the age of six led Levon to decide then that music was to be his career path. Young Levon was exposed to both country music though the Grand Ole Opry broadcasts, and African American music though traveling stage and tent shows. After high school, Helm joined the band of fellow Arkansan and rock pioneer Ronnie Hawkins. Hawkins took the band to Toronto in 1959, and Hawkins and Helm put together a mostly Canadian group which would eventually become The Band, with Robbie Robertson, Rick Danko, and Garth Hudson. After Hawkins and the others parted company, they were sometimes known as Levon and the Hawks. Eventually, by the mid 1960s, when Bob Dylan went electric, Dylan invited the group to work with him. Helm left the band for a while, after the negative reaction among the traditional folk music crowd to Dylan's electric approach, but Helm rejoined in 1967 to record Music from Big Pink which became one of those era-defining albums, which in a way, became a kind of template for the whole roots-rock scene, incorporating folk, blues, rock and country in a more laid-back, down-home but eclectic sound. Helm's vocals were an important part of the group's sound, even though others in the group sang lead vocals. Helm also has had a career as a film actor. In the late 1990s, he suffered throat cancer, and the radiation treatments and surgery left his voice greatly weakened. He concentrated on drums for a while, performing at his series of concerts called the Midnight Ramble at his studio in Woodstock, NY. He was able to resume doing vocals by 2004, and in 2007 released Dirt Farmer his first solo album in 25 years. Now, less than two years later, he is out with Electric Dirt, which continues his blend of roots, country, blues and Gospel in what I think is one of the best solo albums of his career. The title is a little ironic in that most of the album's instrumentation is acoustic -- there are some subtle electric guitars and organs here are there, but most of the time, the recording has a distinctly down-home, back-porch feeling. And Helm's voice seems to be stronger this time around as well. Joining Helm on the new recording is his daughter Amy, who is also part of a band called Ollabelle, some of whose members appear on the CD. A prominent presence is guitarist and multi-instrumentalist Larry Campbell, who also produced the CD. Other regulars include bassist Byron Isaacs of Ollabelle, and Brian Mitchell on keyboards and guitar, plus a horn section and some additional backing vocalists. The CD is an interesting and often compelling mixture of songs from sources ranging from the Grateful Dead to the Stanley Brothers to Muddy Waters to the Staples Singers, plus a couple of originals. The group is tight, the sound authentic and the mixture of influences in the remaking of the old songs is often clever. Levon Helm's new CD Electric Dirt is probably his best solo album to date out of his work with the classic group The Band. His cancer-affected voice has recovered to be as good as ever, sounding much like the Levon Helm of old, and the 68-year-old drummer and vocalist has assembled a great bunch of musicians to join him on this CD which embodies the kind of musical cultural blend that Helm experienced growing up in rural Arkansas. The music has a great blend of informality with great musicianship, cultivated, no doubt, in his Midnight Ramble concert sessions. Our grade for sound quality is close to an "A." The acoustic/electric instrumental blend is nicely captured. Helm's vocals are delivered in a manner that conveys both the weathering of his voice, as well as his strength. The dynamic range, while not at audiophile levels, is better than your average contemporary rock CD in conveying shades of loud and soft. Levon Helm has had nearly a 50 year career in the music business. His new CD Dirt Farmer shows that he's still in top form.